The first time I bought some UART bluetooth devices, I ordered them on suntekstore.com website. Since these devices seems promising, i ordered a few more on DealExtreme for my job. I discovered that even these boards seem identical, they had different firmwares. The suntekstore ones has HC05 firmware, the DealExtreme ones has linvor 1.5 firmware. The differences between them is mainly the AT command set. This firmware offers a very limited set of AT command. By default the baudrate is 9600 8N1. For this firmware you have to not send LF or CR character at the end of your AT command.AT programming mode is up when your board is not paired by bluetooth devices. For this firmware, you have to copy/paste AT command since timings is important. You can send about one command per second. And that's it !!! No other AT command. In the next, post I will provide some links to the HC05 firmware. This one is a bit better than HC06. 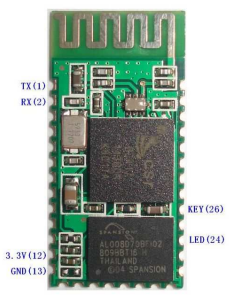 In dealextreme module the Pin 24 is for connection led. 1. How important is the value of the resistors? I mean, it seems to be a voltage divider, can you provide some info on Vin/Vout? I don't think I have these resistor values around and I would like to get started on this. If the voltage divider is for vin 5v and vout 3.3v then a Schottky/3.3v pullup divider should also work, correct? Can be used as a bridge between bluetooth and RS232 ? My model is Linvor (EGBT-046S) from DX. how do You set command mode? The first already works as BT-RS232 bridge; to set it in cmd mode one must connect Vcc to PIO6/WLAN_Active/Ch_Data pin. Is it so in Your modules? is it possible to disable the pairing PIN code request of the module with HC06 fw? since some of my devices have problems with pairing with bt passkey, i have to disable it. Sir you are the boss! I have been trying to get this bluetooth adapter working with the arduino, and ended up spending almost 16hours straight just trying to interface with a pc to try the AT codes! I will try again tomorrow, and hope for the best! Thank you for support. I'm glad that all this stuff help some of you ! It seems they are on to us :p I am unable to download bluesuite from CSR. I am starting to get annoyed. I'm in my third year of Computer Sciences, understand all the terminology, and still can't get a $10 bt module to work. It seems you have found a loophole in CSR's website. Well done. I have downloaded all the available files. I am now looking for a way to use a USB-spi controller for programming/upgrading the firmware. I'm already on it. I'm porting frans-willem dll for buspirate. I need some data dump of guys playing with frans-willem DLL.. I unfortunately do not have a bus pirate. After more extensive reading I think that one isn't required, since I believe I can replicate its function using an Arduino. We use SPI to communicate with the bluecore right? Why not just use a USB-SPI programmer, or create a custom interface using the ATMega microcontroller? If I had access to a parallel port, I probably could sniff the communication and have a better chance. If you have an arduino board, you should take a look to frans willem work ! I also have another problem. I realized that I never tried the BT modules, even with their current firmware. While I am able to send AT, AT+PIN, AT+BAUD, and receive the correct response, I am unable to send AT+NAME, and I can't find it using bluetooth (Tried a laptop, PC with dongle, 2 phones and a WM6 PDA). I soldered an LED with the correct resistor to PIO1 (24), and it blinks normally, and the device is able to reset. I tried to understand Frans-Willem's work, (thankfully I know VB/C#), but have never heard of BlueLab. Is this part of CSR's Bluesuite? Is it downloadable? Also, I still haven't managed to find the bluetooth module by scanning. I am beggining to think that they were part of a pair, and these were master, not slaves. I read somewhere that if the module doesn't respond to AT+NAME, then it is in fact, a master. Bluelab 4.1 is the SDK for developping custom firmware. It is NOT freely available but you should find it with google or torrent search. For AT mode be sure that your module is NOT paired with a bluetooth device. It is a common mistake ! The device can't be paired (even by accident - the led on 24 blinks normally). I am unable to find the module using bluetooth, I have searched using all kinds of devices, but it seems it isn't broadcasting. I have a pair of the same devices, and have the same problem. Do I need to pull-up/down any other pins? I have reset pulled high, and that's all. I really have to try to downgrade the firmware to H05. I soldered a wire to KEY, and just left it hanging. I powered on, and touched it, and the led started pulsing at about 500ms (instead of 100ms as it usually does). I quickly searched, and found it. Can you please confirm that it should blink at 500ms when waiting to pair? Have you seen it blink at 100ms? Mine worked 1st try. It's a 121326 from DX.com. I hooked up 5V, and its LED started blinking. I scanned for BT devices with my android phone, and "linvor" showed up. I paired with it, passcode was 1234, and the LED went solid on. Downloaded SENA BTerm from the marketplace, and told it to scan for devices, then connected to linvor. When I type on the screen, I see the TX line from the module change on a scope. Folks, I really need some advice on this, its driving me up the wall. I have a Linvor 1.5 purchased from Ebay. When I tried it first, it pretty much worked in all respects. Now, it still seems to do about everything, EXCEPT it somehow seems to have lost its name 'Linvor'. Shows up by its address on my Android. Also, when I try the AT commands, all work EXCEPT for the AT+NAMEJOHN_DOE. This always brings up the response OKsetname, but doesnt actually change the name. Any idea at all what could be happening? Like I said, the PC-to-module connection is fine, so is the wireless bluetooth. Just the issue with not being able to change (or give one) the name. For the name of your device you may need to delete your module in your windows environment... I think that some registry key store the name of your bluetooth module according to your bluetooth MAC address. Hi Byron, thanks for the response. For some reason, the above was happening while I was using Hyperterminal (copy-pasting into it from notepad). I used sscom32E.exe, and all is well. Also, thanks for the tip on PStool. Do you know why it is showing multiple serial ports? It is really messing up the Arduino IDE. It still has the Linvor firmware on the device. I really like the simplicity of this firmware, but the multiple serial ports with serial ports that don't work right is making it a pain to work with. Did you know - is there a firmware version with hardware flow control? How can I change BaudRate: I want to set 7 bit instead 8 bit ? Not directly related (mine is the breakout version) but may be useful to some. Found and changed a simple Arduino sketch to allow AT commands to be sent to the Bluetooth adapter. I really thank you. It was usefull to set up my new livor boards, to work with a MegaSquirt. Thanks! I have WML-C40AH module, can anyone BlueRadio (BR-C40#) or other firmware posting for this module? I have the Linvor module. Can send and receive from terminal but can not get any response from AT commands....? Have tried unpairing the module on the PC and added \n and \r\n to AT in case it's HC-05 firmware but no joy. Also tried powering the module with Pin 26 and Pin 34 to force the module to forget last pair but again no luck. Any idea why not 7 bits?? I will send you beer money if you answer my question. When I change the baud rate using AT+BAUD8, I am changing the bluetooth baud not the arduino baud. The arduino baud stays at 9600. Could you tell me what kind of response you got from the module ? If you got the right response, your module should be good when you reset your device or leave the AT mode (just try to pair it with a blutooth device). Yes it does do into the higher baud on the bluetooth side. So I do get a ok115200. But on the arduino side(with the wires) it stays at 9600. Hi Byron, Thank you so much for supplying this information. This is very helpful! I have an HC-06 module. It was working fine, and then I enabled 460800 mode - now I cannot communicate with it- I only see garbage in transmission. Is there a way to reset the factory baud rate with this module? maybe with a pin connection upon power-up? Thanks. I noticed the HC-05 allows you to pull a pin high to force the 38400 baud rate. Is the HC-06 different? I'll look at the pskey tools. Thanks again! Hi, can someone tell whether the device supports baudrate 8192? This device is horrible. The one I have answers as linvor 1.8 and is supposed to be an HC-06, but no matter what I do, I can't get the bluetooth function to send or receive anything. I thought it was a baud rate issue, but it's not. I cycled through all the baud rates. I flipped rx/tx but still nothing. The lack of documentation when you order the product is pathetic. Hi! First of all, thanks for the information. I purchased two BT modules with HC-06 firmware. Can they work as Master device or i have to download the HC-05 firmware. Thanks again! set this bluetooth to 1382400 baud, now do not get to communicate with bluetooth because I have a program that trebaje at that speed. how do I return to a "normal" speed 9600 baud. how to connect hc05 wit hc 06 ? I set my JY MCU (BT Board V1.05) baud rate 9600 to 460800. The response from JY MCU was OK460800. So please guide how to chance baud rate from 460800 to 9600. MasterCoder, I have the same exact symptoms as you, but I'm driving 5.03 volts into the unit. I'm actively searching for a solution. Does any one have the source code for th HC05 or HC06 ? I want the led to be off when not connected and on when connected - why ? - this will enable me to turn on a device (on led) when i connect to an approved bt phone (after pairing) - i.e unlock my car!!! open my door!!! - no Arduino - no CPU - just this simple BT module . Can anyone pls pls help me - this idea is free for anyone . pls contact me if there is a simple way to have one of the pins on these module 1 when paired . very simple - pls email me at moriszen[AT]gmail[DOT]com. I was wondering if,we purchase just BC417 ext chip and one EEPROM(for storing stack) and integrating it on breadboard(instead of purchasing HC-06 module). Can we flash this integrated module(on breadboard) with some firmware and make it work as HC-06 module. It will be big college project if we can do so !!! Is it possible ? Is it possible to read the software from another module?He wants to make copies of acting ? Some words about me !